Spring is around the corner, and that means the prom season isn’t far. You are perhaps hoping the night is already here! You have purchased the perfect dress or rented the best-looking tuxedo, you have asked your dream date to be there, and you are all set to go. 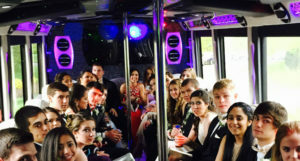 When you have got prom night in NJ, here’re the best reasons to consider hiring a prom limo or party bus. On the prom night, your dad & mom are bound to be concerned about you breaking curfew. Set their mind at rest by hiring a prom limo in NJ & NYC. Our professional and courteous chauffeurs will surely impress your parents, and the fact that you planned beforehand will most probably earn you some serious credibility. Your parents will also rest assured knowing that our professional chauffeurs will drive you back home at a mutually agreed time. There will be no frenzied text messages or missed calls! While you enjoy your special night, your parents also will rest assured knowing you will be at home on time and of course safely. 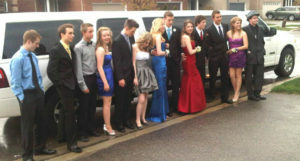 Our prom limo is also the best ride you can offer to your date and let him or her know that you love going the extra mile. In fact, what date would not wish to be picked up by a professionally uniformed chauffeur with a spacious & well-appointed limo beckoning? It is also a wonderful opportunity to take a selfie together! Prom parties can go very late – and sometimes there is also after party at a friend’s home. 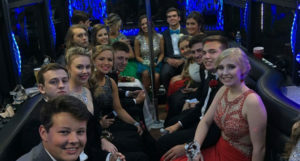 The parents of everyone in your prom group will be in peace of mind knowing that there’s a professional chauffeur to pick up the group & bring all of them back home safely. Regardless of how late the party carries on, our trained chauffeurs are ready to come & get you. The dress or tuxedo you have rented is going to play a vital part on the prom night – so they definitely need special attention. Prom outfits are generally marked that no returns are accepted, and when you rent a tuxedo, you’ve to get that back to the rental store at the agreed time. That means you could spend the whole night thinking about making certain your dress stays looking perfect or you could rent our Prom Party Bus in NJ & NYC to help you get to & from your prom. Our super clean & spacious limousines will make sure you look fabulous all night. You are just a phone call away to have the luxury of our prom limo in NJ & NYC. Call us at 877-770-6225. Wedding Bus Charter Makes You Relaxed And Ready For Your Big Day! Which Limo Service In NYC Should You Choose?